Oh how I wish I could say that the final seconds of “Ask Him About Stella” were enough to carry the entire episode. After teasing a How To Get Away With Murder/Scandal crossover for a while now—something I thought was only possible in my wildest of dreams and fanfiction—we get our first brief glimpse at what a world containing both Annalise Keating and Olivia Pope looks like. The camera tracks Olivia from behind, anyone with even a cursory knowledge of Scandal sure to recognize Kerry Washington’s frame, the determination in her walk. Mimicking the intro sequence and a defining moment from the series’ pilot, she writes “How To Survive A Scandal” on a chalkboard as Annalise takes in this new guest lecturer with a curious smile. It’s a really fun moment on a show that has forgotten how to have fun as of late. Because the rest of “Ask Him About Stella” is quite the downer, and that’s actually putting it lightly. There is no light in the dark, messy vortex that is this episode, which is one of the most unfocused of the season. The big reveal that Laurel’s mom knew Wes at the end of the episode falls to the wayside entirely, Laurel’s mom barely appearing at all, and Frank working hard (read: slowly) to crack the case, turning up with nothing and just confronting her at episode’s end. Needless to say, we don’t have any answers yet. At times, the episode feels like a rapidfire facts machine, characters spitting out facts about the prison industrial complex, systemic racism, and class warfare without pausing to breathe. 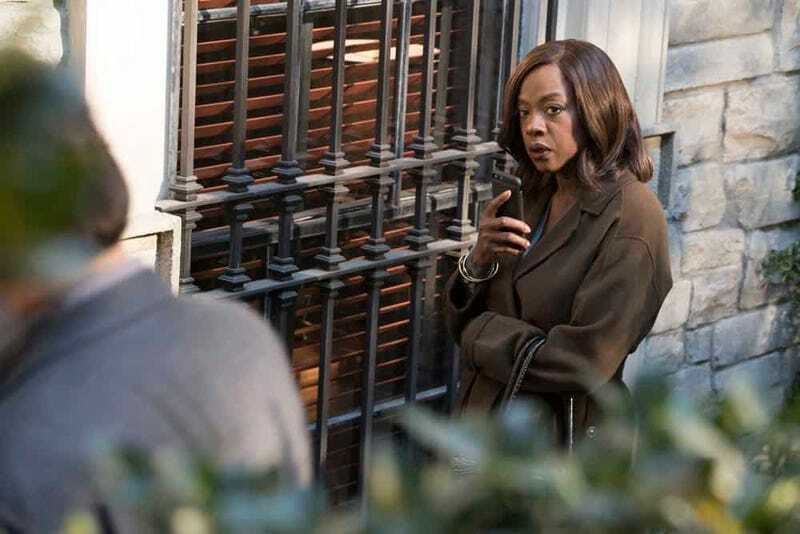 How To Get Away With Murder’s determination to convey just how profoundly broken the justice system is has been one of its strengths, but this is not the way to divulge nuanced and meaningful commentary. 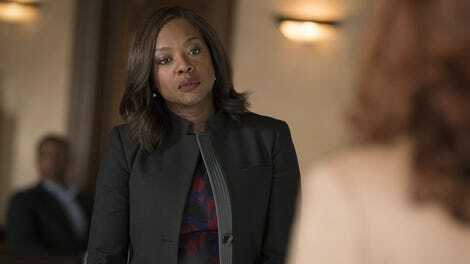 Spitting out facts and numbers is a lifeless way to tell a story; that’s the whole point of Annalise’s frustration when the state Supreme Court requests that she submit a memo instead of allowing her to present her case at trial. And yet, this episode is guilty of the exact problem it points to, reducing people and their stories to facts and numbers and neat little talking points. There is the well executed sequence that jumps between Connor and Michaela rattling off these facts and Nate’s father sharing his personal story. There’s a contrast as well as an interplay between the two settings, and it works quite well. But there’s still an overall disconnect between the way the characters talk about the class action and how Nate’s dad fits into all this—especially since the hasty attempts to fill in the character are so mechanical and transparent rather than this story unfolding organically. And then the class action just sort of falls apart off-screen after all that build up? Sure, Olivia Pope’s keeping the hope alive with the promise of a shot at the Supreme Court of the United States, but it still reads as a strange unraveling of the storyline. The actual central storyline of the episode, however, ultimately exists outside of the class action even though it touches it ever so lightly. At the cold, dark heart of “Ask Him About Stella” is the tragic ballad of Isaac Roa, who starts doing drugs again after learning about the DA investigating him for his daughter’s own death. As it turns out, his daughter did overdose on his drugs, a fact he covered up to save himself and make sure his ex wife would never find out. So we actually don’t know how long Isaac has been sober, since he lied about that and so many other things. Watching him slip back into addiction is unnerving, and Jimmy Smits gives a stellar performance, always keeping us slightly guessing as to what kind of state Isaac is in and then making it clear at just the right moment. But Isaac Roa is still the most confusing character to ever be on this show. Even after giving him this backstory, I’m still not convinced that the character serves any real purpose to the story. Everything about him feels either convenient for the plot or just straight-up incoherent. The explosive scene between him and Annalise near the end after she realizes he’s high again is so out of left field and not even that well acted (which is tough for me to say since Smits are Viola Davis are truly two of the greats)—although that could mostly just be because of the thin writing. Sure, drugs make people say and do things that are out of left field, but it just comes off as so disingenuous. Of all the fucked up relationship dynamics in this show’s history, this might be one of the most fucked up. But why? Isaac’s introduction to the show mostly just seems like a way for How To Get Away With Murder to get some more awards play, bringing a powerhouse actor like Smits in to match Davis’ masterful performances. But nothing about that scene makes any sense. Isaac and Annalise as sober buddies in the diner scenes makes so much more sense. Isaac went from being a bad therapist to being a really bad therapist who somehow is a sudden focal point of the show? Whatever happened to the handful of other characters who used to actually get real storylines and meaty material? At least Laurel has a little bit of emotional work to do in this episode, but the others are...not bringing much. And then to cap off the episode’s focus problem, Connor decides he’ll marry Oliver after all, apropos of absolutely nothing! That’s a pretty big characters shift that is based on...yeah, nothing! Again, if only Olivia Pope could swoop in and fix it all. She’s good, but she’s not that good. I am very behind on Scandal, but I have a little under a month to fix that, and I shall! I know not everyone who reads these recaps necessarily watches that show, too. But I want to be prepared. Karla Souza continues to kill it. Thank goodness the ADA was not fooled by Bonnie’s act, because it was so blatantly transparent that she was helping Annalise that it would have been hard for me to buy anyone falling for it. That being said, I’m very worried about Bonnie! I hope Tegan isn’t gone forever.